The Cottage is a comfortable retreat with historic features of its former life. Located adjacent to our home, we're on hand to give help or advice but far enough away to allow privacy. Post Office Cottage is self catering which means we provide some breakfast basics to get you started but you need to cook your own meals. It has a single living / bedroom with a separate kitchen, bathroom and toilet. Due to its age, the cottage isn't perfect, but we think that just adds to the charm, character and uniqueness. There is a Queen Bed and a fold out couch and we provide linen and duvets for both. The bed has an electric blanket and there are hot water bottles, a wool blanket and quilt to keep you toasty warm in winter. If you are travelling with a baby, a portacot is also available but you will need to provide your own linen. We can also provide a highchair - just ask if you need it. For older children, there's a box of kids toys, books and DVD's. The kitchen has a stove, microwave and small fridge and a basic selection of pots, pans and utensils to allow you to cook a meal. If you find you're missing anything, of course you're always able to borrow it from the main house. We provide breakfast cereals, milk, plunger coffee and a selection of teas to get you started and if you book more than two nights we'll also leave you with bacon and eggs and bread for a cooked breakfast. When the hens are laying, you'll get our own free range eggs! The bathroom is small with just a shower and hand basin while the toilet is located off the main area in what was originally the telephone booth - complete with original felt soundproofing. For entertainment on rainy days there is a TV with basic TV channels and a DVD/BluRay player with movies (or bring your own). We also have books, puzzles and board games if you want to stay in and relax. There is WIFI in the cottage which is linked to the internet connection through the main house. Guests are welcome to access our garden and the 1.5 acre property. We have two young boys (10 and 9) who love to meet new children and are happy to share their toys and trampoline. We have a cat (Cocoa) who lives in the house with us. She has been known to visit the cottage so if you have an extreme allergy to cats this may not suit. We also have a pet sheep (Wallace) who lives in a paddock beside the cottage. He's friendly and usually happy to be patted and have his photo taken with visitors. We're happy to help when required, but do both work so we may not always be available in person during the day. I can usually respond to messages so don't hesitate to get in touch with any questions. If we're home, come over to the house if you need anything and if you'd prefer to be left alone to do your own thing, we'll respect that. Please be aware that this is a rural property. Post Office Cottage relies on rain water for its water supply and has a septic tank. We ask that you conserve water where possible by being mindful of the length of your showers, and are careful not to flush anything unnatural down the toilet or sinks. Neither the water supply, nor septic tank are likely to impact on your stay if you treat them with respect. Despite its proximity to New Plymouth, Post Office Cottage has poor cellphone coverage on the vodafone and 2degrees networks. Texts can usually be received in the Cottage but phone calls often won't connect. There is no problem with the Telecom or Skinny networks. Why do we charge a cleaning fee? It covers the cost of a hour's cleaning and also for the linen hire of the space. We choose not to build it into our nightly rate because we feel that punishes guests who only stay one or two nights. It's a one off charge, so the longer you stay, the less on average, you pay per night for cleaning. There's a shower and basin in the bathroom. The toilet is in the old telephone booth, located off the living room. We have a micathermic heater and ceramic wall mounted heater. Bed linen and bathroom towels are provided. We use a laundry service to ensure hotel quality linens. There is parking on site. Please don't park on the grass. The cottage is studio style living and bedroom. A bar fridge with just a small freezer. A four element stove with electric oven. There is a coffee plunger (french press) and we provide a few servings of fresh ground coffee to get you started. We provide basic pantry items. Milk, cereal, tea, coffee, salt, pepper, oil and mixed herbs as standard. Book for two nights or more and we also provide bacon, eggs and bread. The kitchen has a full stove, microwave, toaster, kettle, pots, pans, cutlery, crockery, knives and utensils. You should find everything you need but of course, we can also lend items from the house. There's a small dining table and two chairs inside the cottage. There's also an outdoor table and two chairs on the deck. Sit in the evening sun with a glass of wine! There's a small TV with basic (freeview) channels. Cards, Monopoly, Trivial Pursuit and jigsaws will keep you entertained on rainy days.. There's a small selection of kids toys and books stored in a plastic bin under the bed. There are a selection of DVD's and Blu Rays for adults and children alike. You're welcome to wander the garden and explore. Kids can use our trampoline, climb trees or kick a ball around. There's a verandah that wraps around the cottage for morning or evening sun. New Plymouth has many Golf Courses within a 20 minute drive. Inglewood, Westown, Fitzroy, New Plymouth, Waitara and Manukorihi clubs all welcome visitors. New Plymouth was names as 2nd best region in the world to visit in 2017. We have it all - beaches, bush and mountain! A lovely , quiet and cosy place to stay. Thankyou. We loved every moment of our stay. Loved the cottage with it's character and lovely nostalgic touches. It was so welcoming to arrive to fresh produce to begin our stay, after the long drive to get here also. It was a pleasure to host you. We appreciated your communication before arrival and that the cottage was clean and tidy when you left. So glad you enjoyed your stay with us! The cottage is a beautiful old building. The cottage is a beautiful old building. It was immaculately clean with really nice decor. The bed is large and comfortable, it is well equipped and the breakfast provisions were really nice. Only 2 small criticisms, the TV is quite small [but who goes on holiday to watch TV] and the deck was a little slippy. However, if this property is available, book it would be my advice! The Post Office Cottage is a simple charming experience. The Post Office Cottage is a simple charming experience. The massive big window behind the master bed that looks directly onto the private garden (trees and shrubbery) was stunning. the kitchen was well stocked with basics and the opening windows everywhere afforded plenty of fresh air. Despite being a small, simple one main room, the cottage is full of history and interest. Many of our meals were spent on the lovely front veranda. The stay was a highlight of our recent family holiday. The post office is beautiful and we would certainly stay here again and recommend to family. The post office is beautiful and we would certainly stay here again and recommend to family. We loved the features of the post office (including the toilet being in the old telegraph office!) . Everything we needed was there. 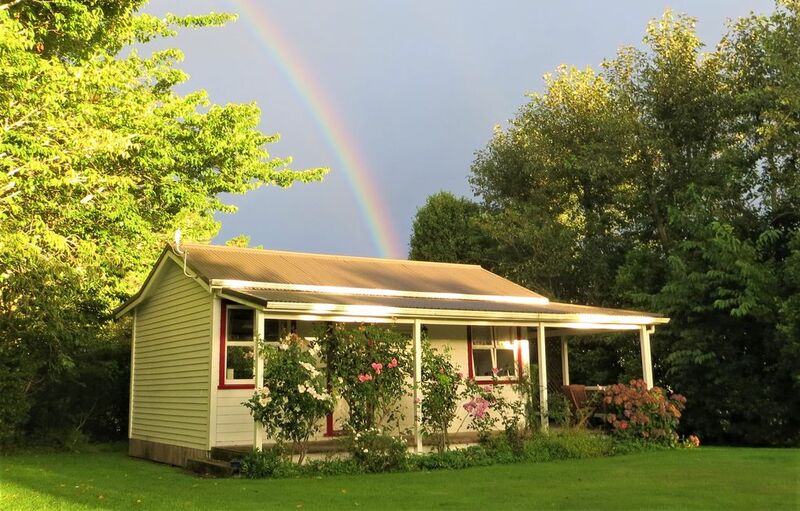 An ideal location for exploring taranaki and new plymouth, as well as providing a restful and quiet break. Looking forward to visiting again sometime! Lovely, cosy cottage in beautiful settings. Lovely, cosy cottage in beautiful settings. Perfect for our one night stay.